Before I saw these little numbers on The Bride With a Blog (aren’t they cute?) I confess to having something of an antipathy to toppers for the wedding cake. Most of what served as reference included plastic versions of a bride and groom in conventional white dress and black tuxedo that served no purpose but to differentiate one cake (birthday) from another (wedding). But this whole DIY trend that is infecting weddings with fever, resulting in nothing short of a rash of incredibly unique ideas and fancies, has meant that even wedding toppers have got an overhaul. Now you can even have them custom made for your wedding, so that you end up with an ‘original piece of art’ that is guaranteed to get you into the pages of a Bride magazine, or, at the very least, will draw more than a few oohs and aahs from your guests. The significance of cake toppers has escalated to such an extent that they are touted as your way to ‘express your individual style’. Admittedly, the predominant trend is still inundated by little plastic figurines, although the diversity and the postures have increased. But dig a little deeper, and have a closer look at design sites like etsy.com, and you’ll see a completely different take on the toppers. Now you can get them in wood, paper and textiles with an originality that far surpasses the plastic generation, and brings humour and artistry to the mix as well. 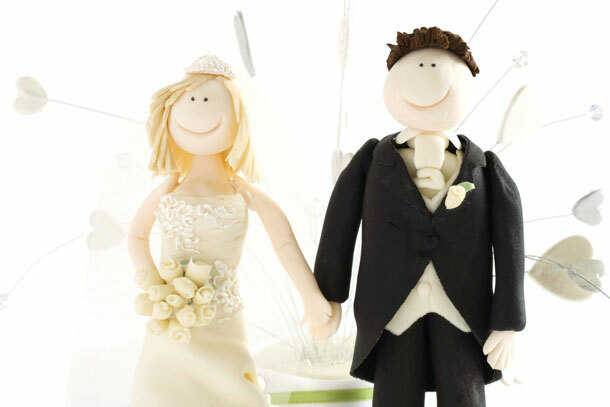 Wether you want to dress your cake top simply with flowers, a monogramed topping, original and arty figurines or something more humorous, there is so much more to choose from now than before. Symbols like kissing doves, intertwined hearts etc. That ‘s if you’re going the wedding cake route at all, as they’ve been described as cheesy and outdated by advocates of the dessert table. Unique wedding toppers for your cake..
Waar kry ‘n mens dit? Who makes these, they are adorable and just what i am looking for. If i forward you a picture of my wedding cake topper will you be able to make it as well a give me a quote as to how much it will be. So where can one find thses amazing toppers. I just think they are soooo adorable. I love wedding cake toppers! As a wedding photographer it is the first thing I look out for when heading over to photograph the cake. I have seen some pretty amazing things on the cake, and some really funny ones too. I recently did photography at a wedding where the topper was an edible wedding couple where the bride had her hands around the grooms neck, chocking him! I have heard of these toppers, but this was the first time I actually saw one. Most brides take care in selecting the toppers, and cake for that matter, and every photographer should know to get the details, not just one or two full-frame shots. Get in closer and take shots of just the topper, the adornments on and around the cake. That cake is going to get the cut later and all the couple will have to show for it is going to be photos, so get enough!